Love mermaids or know someone that does? 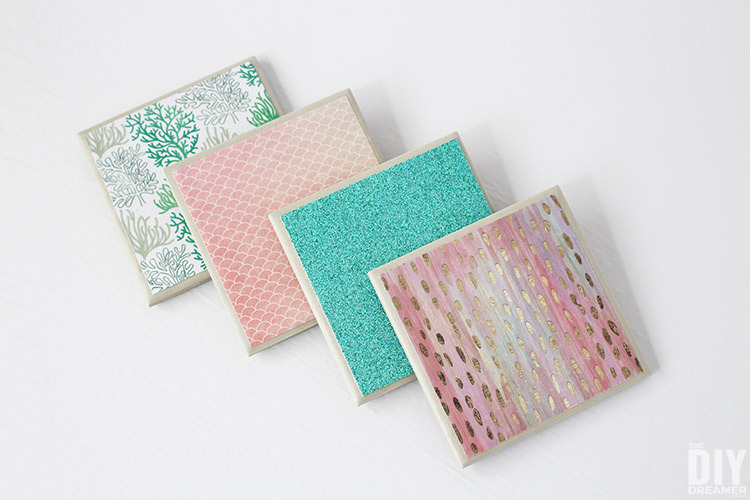 Make yourself (or make some as a gift) beautiful Mermaid Tile Coasters! 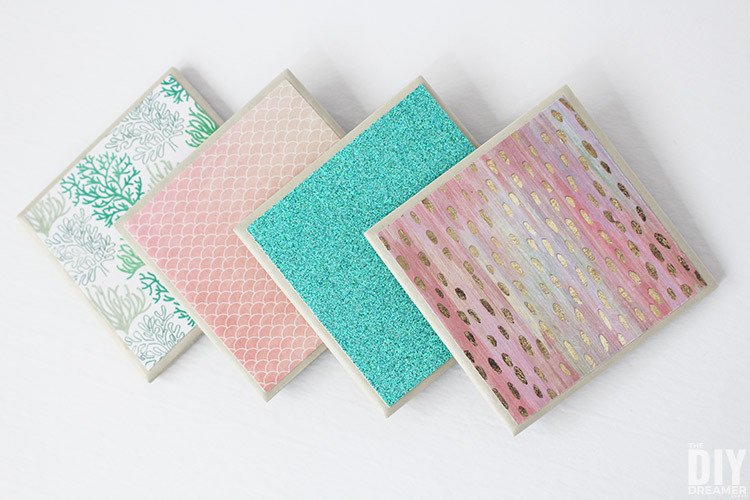 These shimmering mermaid coasters are going to bring smiles to all mermaid lovers. Gabrielle had been asking me to make her a coaster to put on her desk in her bedroom so that she could place her afternoon tea on it. Since I still had a lot of tiles like the ones I used to make tile coasters a few years ago, I figured I may as well use some of those tiles to make her a coaster. Next I had to decide how to decorate the tiles. My daughters LOVE mermaids, honestly though.. what girl doesn’t? With that in mind, we headed to Michaels on the hunt for mermaid scrapbook paper. 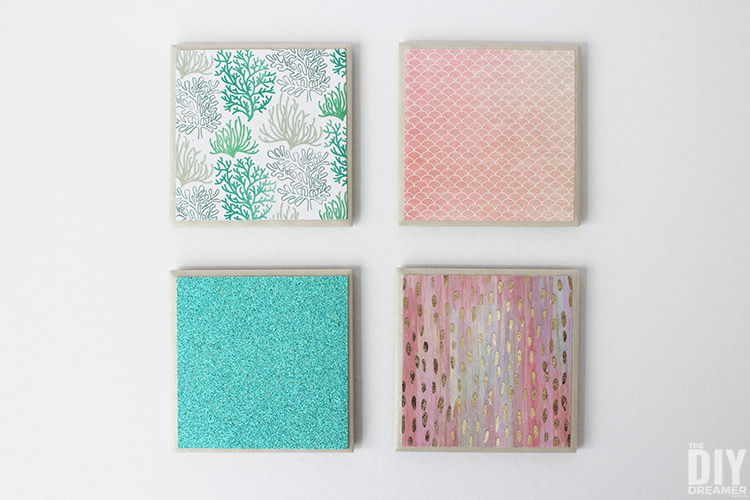 Goodness, did we ever find beautiful mermaid scrapbook paper, perfect for our mermaid tile coasters! With the tiles and scrapbook paper on hand, we started working on the tile coasters. This post contains some affiliate links (which means if you make a purchase after clicking a link I will earn a small commission but it won’t cost you a penny more). Click here to read my full disclosure policy. 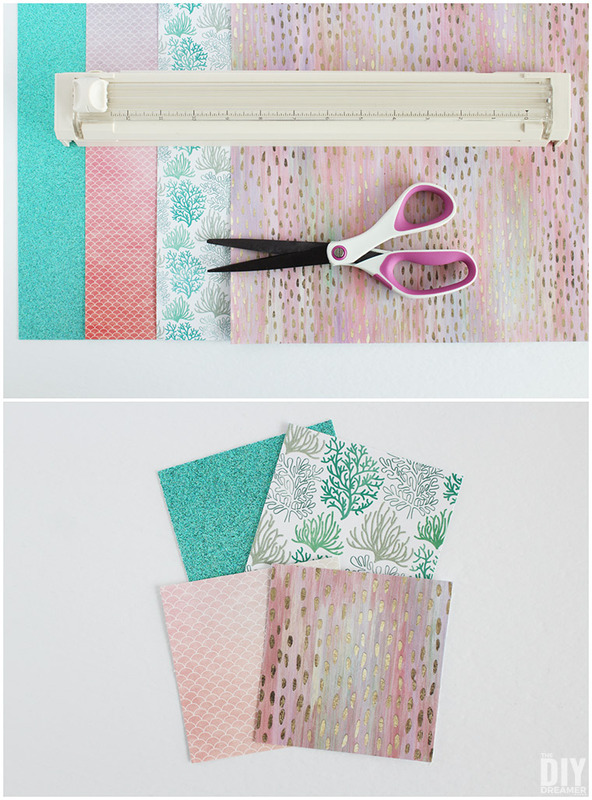 Step 1: With the help of our paper trimmer (scissors obviously work too) we cut out pieces of scrapbook paper slightly smaller than the front of the tiles. 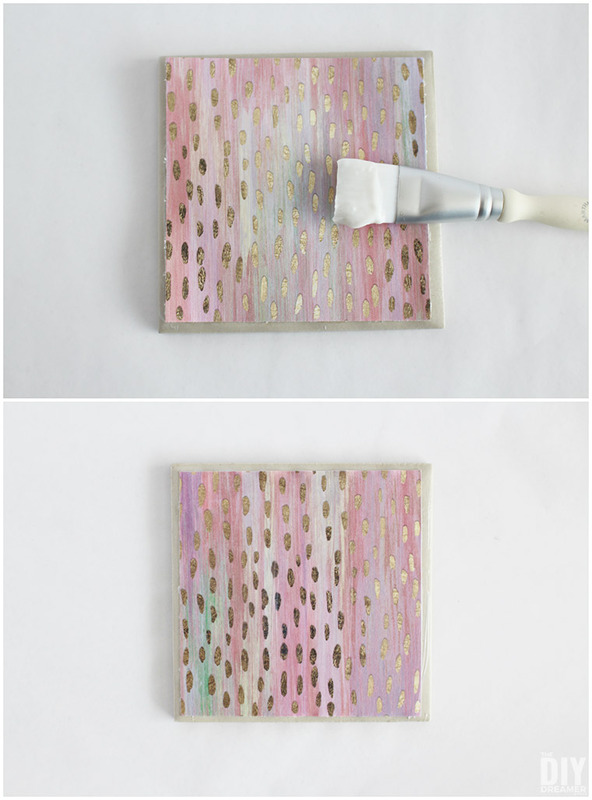 Step 2: We applied decoupage glue (Mod Podge works too! I wasn’t able to open my container of Mod Podge so we used Martha Stewart Decoupage instead.) with the help of a paint brush all over the front of the tile. 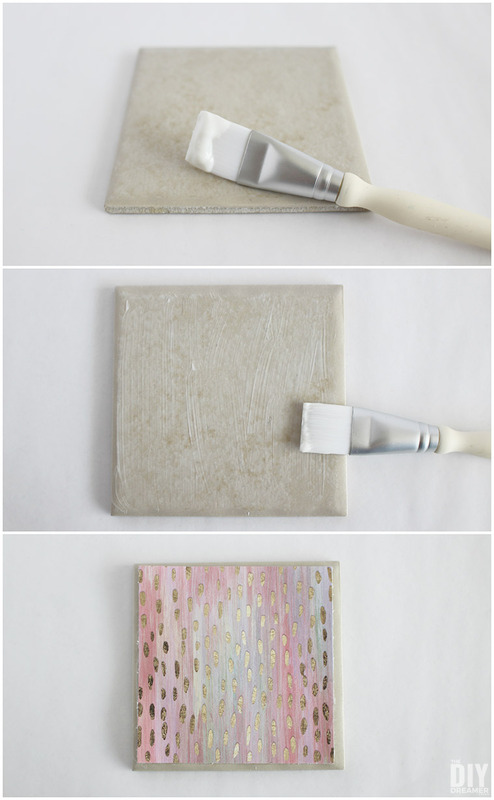 We worked on one tile at a time so that the decoupage glue wouldn’t set before we could apply the paper over it. As soon as we had applied decoupage all over the tile, we placed the scrapbook paper over it, and pressed it down into place. 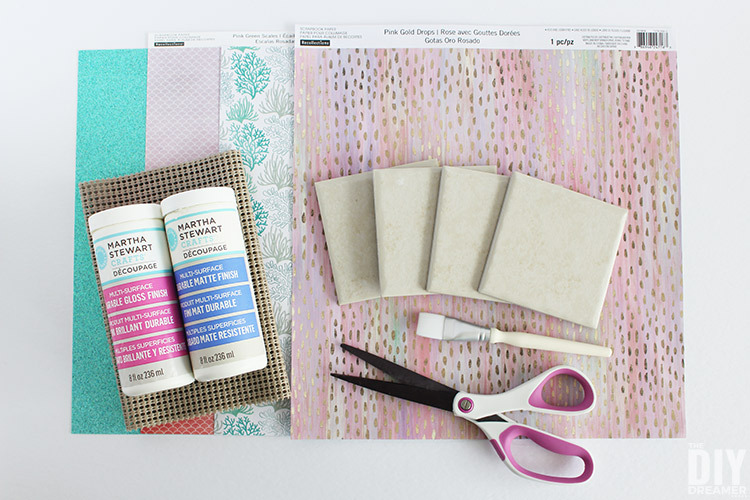 Step 3: Then we applied decoupage over the scrapbook paper. Once completely dried, we applied a second coat over it. Step 4: We cut squares out of the non-slip shelf liner big enough to cover the back of the tiles. We applied decoupage on the back of the tiles, and placed the non-slip shelf liner squares over them. The non-slip shelf liner prevents the tiles from scratching surfaces and also prevents the coasters from sliding around too much. Aren’t they so pretty? They sure make my daughters smile! 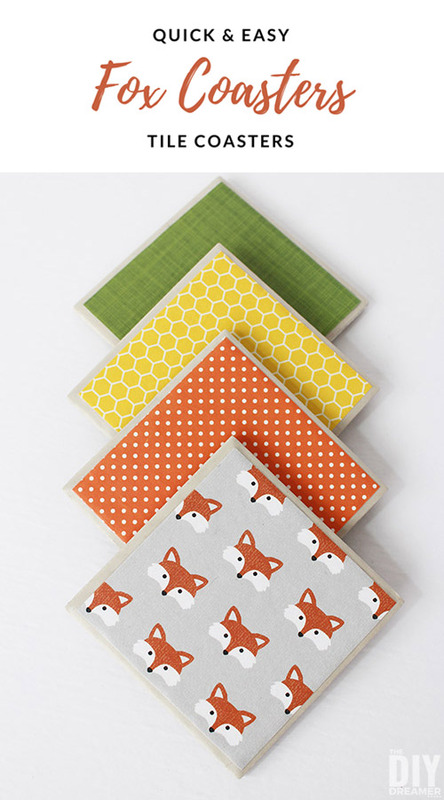 While we were at Michaels, Gabrielle spotted scrapbook paper with foxes all over it. 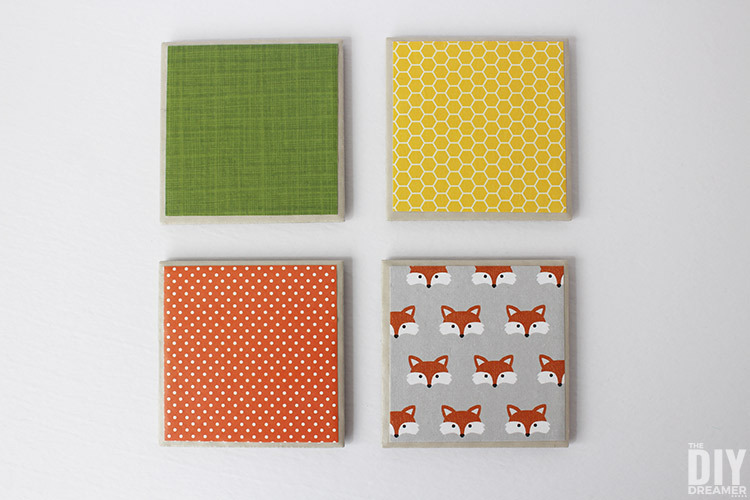 She told me I had to make myself some Fox Tile Coasters too! So guess what I did? What do you think of my fox coasters? They are fun too, right? 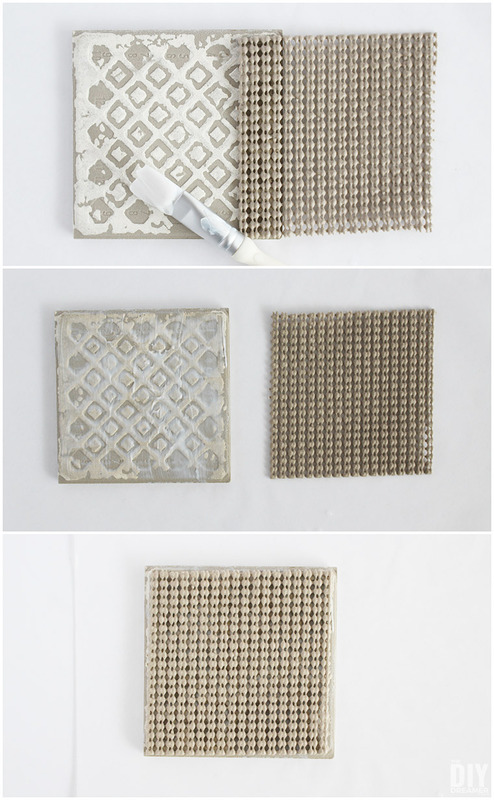 Making tile coasters is so much fun! So many fun possibilities! If you want to see more ideas, check out my other tile coasters. 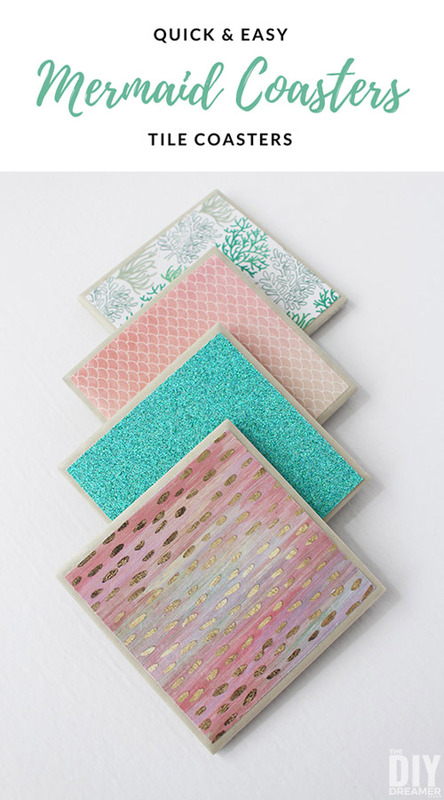 I really hope you enjoyed this Mermaid Tile Coasters tutorial and that I have inspired you to do some crafting of your own. It’s really gratifying to craft something. Cute and great (easy) gift ideas! Visiting from Made By You Monday. What a cute idea! Thanks for sharing at Home Sweet Home! Gorgeous colors!!! I could see these piling up! They are lovely, and you are right, who doesn’t like mermaids? I think my favourites are the foxes though, so sweet. Thanks so much Julie!! The foxes are really sweet, right?! Do he tiles keep the moisture from the glass out or do they need to be sealed with something after the Mod Podge?